Ultrawideband (UWB) that is regulated by the Federal Communications Commission (FCC) for short-range high-throughput wireless communication and sensor networks with advantageous features, such as immunity to multipath fading, extremely short time duration, being carrier free, and having low duty cycle, wide bandwidth, and low power spectral density, has been a topic of interest recently. By wireless transmission, UWB communications systems can only operate in a short distance of a few meters to tens of meters. The convergence of UWB and optical fiber distribution techniques, or UWB over fiber, offers the availability of undisrupted service across different networks and eventually achieves high-data-rate access at any time and from any place. To distribute the UWB signals over the optical fiber, it is also desirable that the UWB signals can be generated in the optical domain without having extra electrical-to-optical conversion. In addition, UWB signals that are generated in the optical domain can be easily tailored to have a spectrum that meets the FCC-specified spectral mask. 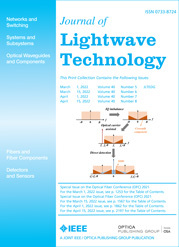 In this paper, techniques to generate UWB signals in the optical domain will be discussed. These techniques are divided into three categories, with the generation of UWB signals based on the following: 1) phase-modulation-to-intensity-modulation conversion, 2) a photonic microwave delay-line filter, and 3) optical spectral shaping and dispersion-induced frequency-to-time mapping. The areas for future development and the challenge of implementation of these techniques for practical applications will also be discussed.